While brushing your teeth and flossing daily, scheduling regular dental checkups, and not suffering from crippling pain caused by an oral health problem all seem pretty basic by today standards, that wasn’t always the case. The practice of dentistry has come a long ways since its inception, and often doesn’t receive enough credit for the scientific advancements it has helped develop over the course of history. The earliest known recorded case of treating tooth related problems dates back all the way to 7000 BC, where evidence suggests that members of the Indus Valley Civilization – located approximately where Pakistan and Afghanistan are today – treated the mouth for tooth decay. These early treatment methods involved bow drills, which the ancient society used for drilling into wood and into a patient’s troublesome tooth. While this sounds unpleasant, historical reconstructions have discovered this technique surprisingly effective at boring out teeth rotted with disease. Roughly 2,000 years later, the ancient Sumerians began blaming tooth decay on tiny worms that would burrow holes into a patient’s teeth. Once imbedded, these worms would continue burrowing holes until a tooth had completely fallen apart. Incredibly, this theory remained part of common medical knowledge all the way until the 18th century when French surgeon Pierre Fauchard – known today as the “father of modern dentistry” – published Le chirurgien dentiste, “The Surgeon Dentist” in 1728. Despite the advances made in the Indus Valley, teeth drilling wasn’t commonly practiced around the world. Starting with the ancient Greeks, the treatment of pain and decay usually resulted in the patient having his tooth extracted. 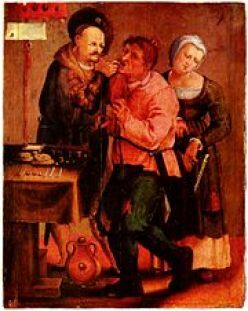 The idea of having a tooth extracted from the mouth using forceps carried on well into the Middle Ages, and was used to treat a variety of diseases. Strangely, the individuals who performed the majority of tooth extractions were not surgeons or doctors, but barbers. Dating back to the 14th century, barbers would use tools such as “dental pelicans” and “dental keys” to pull teeth from a patient’s mouth. Both of these tools were similar in design and function to the modern day forceps. While barbers pulled teeth, they were in no way dentists or even interested in helping to treat an individual’s oral problems. A barber’s goal was only to help alleviate the pain caused by rotted teeth. It wasn’t until the late 18th and early 19th century that concepts we associate with modern dentistry were developed. The work of Pierre Fauchard and his fellow contemporaries helped to lay the foundation of much of what we know about dentistry today. Fauchard was the first to develop a safe and effect process behind dental fillings, and he also determined that acids produced by bacteria in the mouth was a major cause of decay. From this point forward, the science of dentistry began to develop rapidly. In 1840, the world’s first dental college – Baltimore College of Dental Surgery – opened. The increased prevalence of dental studies led for the need of further government oversight, and eventual regulation through the American Dental Association, which was established in 1859. By 1873, Colgate began mass-producing jars of toothpaste, and the nation’s first mass-produced toothbrush hit the market in 1885. Interestingly, the majority of Americans failed to develop regular brushing habits until after World War II, when soldiers stationed overseas brought back European concepts of quality oral hygiene to the states. Today, science continues to make breakthroughs regarding the important role quality oral health plays in helping an individual maintain their overall health. 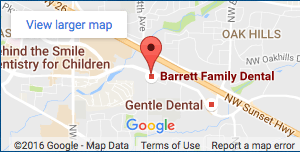 If you are looking for a Tanasbourne family dentist, consider Dr. Richard Barrett and Barrett Family Dental. Call us today to get started!